I remember back in the 90s when my friends and I would endure seemingly endless lines just to get ourselves a couple of donuts from Go Nuts Donuts first branch in The Fort. Everyone was nuts about Gonuts, they were new, different and sinfully delicious. 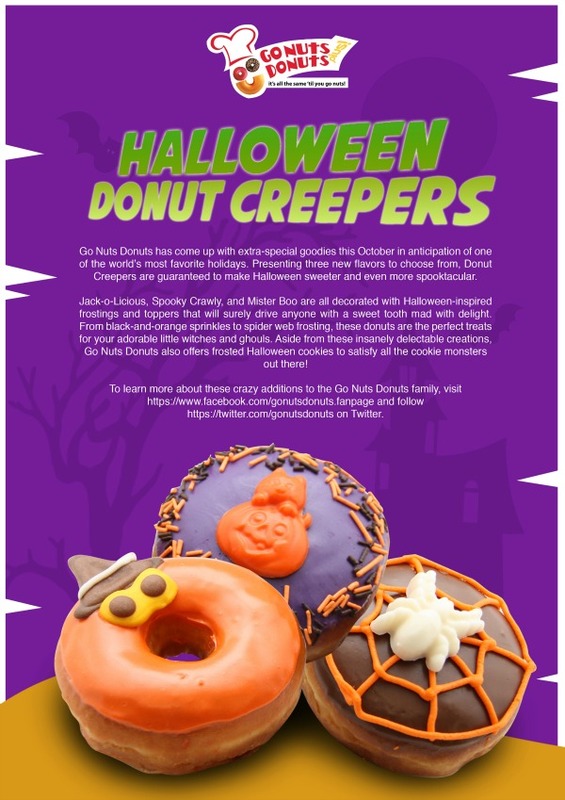 This Halloween, Go Nuts Donuts will have you and your kids going ga-ga over their donuts creepers! Delectable donuts decorated with festive looking pumpkins an ghouls. Perfect for trick or treating! Candy wrappers are full of empty calories and wrappers that litter the streets ridiculous, give Gonuts Donuts Halloween donuts instead for a yummy and greener alternative that kids and kids at heart will truly enjoy. Store them in your refrigerator and re-heat in the microwave for 10-20 seconds. They re-heat wonderfully as if you just picked them off the assembly line! join my nivea like a pogi giveaway!